Use our Visualsoft SEO Site Optimisation Service updated for 2019 which involves us working on your VS website to get the most out of it. 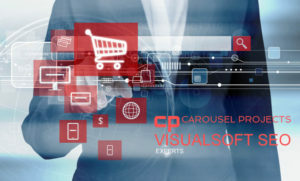 Visualsoft has become one of the go-to places to have your eCommerce website built, their platform is an excellent choice for design and functionality. It’s not like Magento or Woocommerce in that you do not have outside developers working on your website. What the company have done over the years is to push their eCommerce development platform as far as they possibly could. By first building retail sites for people and then combining all of the elements together to be able to sell sites on their own platform. We are one of the few companies who work on Visualsoft websites in the UK, possibly the only one and we can provide testimonials from the happy company owners who we have worked with. Visualsoft Review and Site Audit. We carry out many Visualsoft site audits looking deep into the structure of the sites and informing site owners if there are any inherent problems in the set-up. There are many elements to building an eCommerce store, from initial concept and design, logo and all of the elements that go into structuring the site properly. Let’s assume that you have agreed on the wireframe which is the basic outline of all the elements of the homepage and internal pages. Only after that do you begin to realise that are challenges to overcome with how the site will be structured. Take a look at the diagram below. This is the internal site structure of a typical online retail store – in this case, Shoes. As you can see this is a complicated business, but anyone running an online store will be familiar with the various elements. Typically the site will sell Men’s and Women’s footwear. Let’s ignore for a moment the fact they may sell Children’s and Accessories. 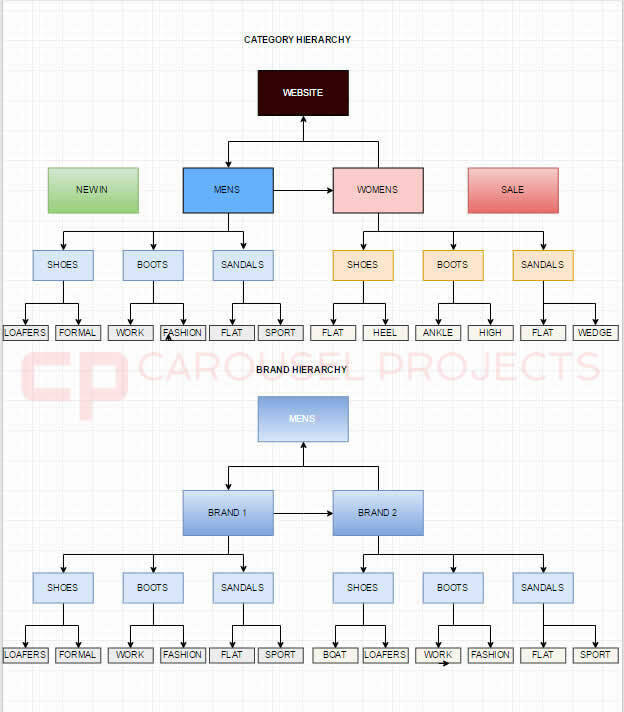 The diagram above shows that under the site we have Men’s and Women’s departments, then beneath those the categories of different types of footwear. For ease, we have only Shoes, Boots and Sandals but of course, there are more. Beneath those elements are the sub-categories of the types of the previous elements so Shoes>Loafers and Boots>Work – see how the hierarchy can get quite complicated? Department – example Mens – needs to have unique meta data and 300 words of descriptive content including keywords surrounding the term Men’s Footwear. Sub Category – example Loafers – needs to have unique meta data, and descriptions. Products (not listed) – all need unique meta data and full, unique descriptions. When you log in to your Visualsoft Website you will see on the top row the menu header Catalogue >> Here you are able to hover over and you have the option to Manage Departments. You can also manage brands. Once we are done with the categories and sub-categories we have to handle the brands here which work in exactly the right way. Department – We assume that this has been covered in step 1 above. Brand – so, for example, Timberland – you guessed it! meta data and descriptions. Brand Category – different to the category page above, this one relates solely to the brand being edited. Unique brand focused meta and content.We can then go on to edit SEO descriptions where we are able to create SEO content at Brand/Sub-category level. The site is set up to inherit brand SEO at this level which can create duplicate on-page content. We can fix that for you. 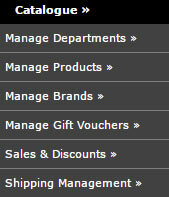 How these are organised in your website is extremely important. For colour do you have one page and feature all the colours as a drop down. If so does the URL change for each colour or does the colour change by Ajax on the page. Similarly, how do you organise tags like heel height and upper design? Sizes? do those appear in your URL and how are they presented on the page? Colours: If style Timberland>’Work Boot’ comes in Black and Wheat – how should the page be organised? Do you have a separate URL for each colour risking Google duplication problems? Do you list the two colours as ajax drop downs on the same page, so that Google doesn’t index the colours? How is this done without creating duplication? Tags – Anything can be used to tag the various groups of product e.g. brogues, heel height, width and fitting. How should they be organised on the page and is there a URL for each one? If you imagine the diagram above, using just the Men’s in the most basic form there are 21 pages. if there are 100 products which is a very small site then there will be 121 pages. If these styles have two colours, there are 242 pages. If each colour has three tags which all have a separate URL. then there are 726 pages – Will you be writing 726 pieces of individual content or would you like us to sort out your site structure? Sizes: Each shoe typically comes in 7 sizes – 11 if there are half sizes. This further multiplies up the number of SKUs to 7271 depending on how the site is structured. Now commonly the size is not shown in the URL so this is in fact not a worry but you can see how matters can get out of control. Some pages in your website can be grouped together or consolidated to reduce as much duplication as possible because one thing is certain. If your site contains acres of duplicate content you are going to be in the SEO doldrums! battling it out with all the other poor souls who are competing with you in the same space. This needn’t be you! What should you do with these pages? If you noindex then you are losing vital link juice. These pages will be hit by browsers, are you just going to block that activity from Google in the name of SEO? These pages offer the same problem, Now imagine if these pages have tags as well. If you look at the article on 5 Common SEO Mistakes you will read in point 1. about my conversation with a site owner about how many pages he had in Google. I asked him if every page had unique content. Problems on the site were caused by what you have just (hopefully), read! His site was a Visualsoft e-Commerce Website site and boy did he need some help. Whether you contact us before your site is in development or after it is launched, we will be able to tailor it in a way that you need it. They have a lot of experience in developing eCommerce sites but you will find that we can add to their expertise to get the most of your site with our SEO knowledge. Like some or all of the elements above. With our expert knowledge of eCommerce and in particular Visualsoft eCommerce sites, we can help you set the site up properly. We can fix potential problems before the site goes live or if you contact us while it is live, we can work with you to fix everything! We can write example content showing you how each page can be structured internally. Advise you on internal linkage and how it is handled but more importantly how not to create duplicate content. We will then leave you with a roadmap of how to keep up the good work or continue to work with you on a monthly basis for a reasonable fee. If any of the aspects of the Visualsoft website you are building worry you and you just want to chat about it then why not give us a call? Don’t become a victim. Don’t sit there and think that it’s the end because your site is not performing as well in search as you expected. Let us come and help you. In a simple phone call, we can identify your needs and produce a report on what your website needs. We will then work with you to implement a plan to fix it. Our pricing to work on your Visualsoft (VS) website is very open and transparent. The initial review and opening conversations are free of course. We will present you with a ‘fix’ document and then discuss ways of working with you to achieve our goals. This will be a combination of us advising on the work to be done and working on the most important elements such as fixing duplicate content issues and Meta. As this is often a complicated process we will often do this over an agreed time period. Some older sites are very complicated and have developed issues over their whole lifespan. The time and price depend on the complexity of your site. If it’s relatively new issues can be fixed within a month. We can then offer an ongoing Visualsoft support package to advise on developments in the SEO sphere and continue to work with you on your website. If you are looking for an SEO Company to work on your VS site then look no further.